FR Pat Cassidy’s days of milking cows are long gone, but the farm boy in him was remembered when he returned to his home town of Nanango recently for a special celebration of his priesthood. 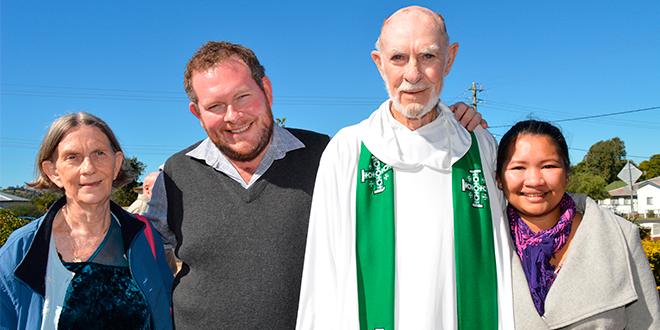 Fr Cassidy, who is parish priest at Gympie, is celebrating his 50th anniversary of ordination. He was ordained by Brisbane Archbishop Patrick O’Donnell on July 1, 1967, in Nanango, the country town north-west of Brisbane where he grew up. He was back there in Our Lady Help of Christians Church recently for the start of a two-day commemoration of his golden jubilee. The next day he was in Gympie to celebrate with his parishioners. Fr Cassidy’s family and a bus-load of parishioners from Gympie joined him for the Nanango leg. “Thank you for being a part of my life and for being an important part of my journey,” he said, according to a South Burnett Online report. The report said that “back in 1967, it seemed fitting for the young Pat Cassidy to be ordained in Nanango, as he was a Nanango lad through and through”. Nanango historian and OLHC parishioner Liz Caffery has researched Fr Cassidy’s background for her upcoming history of the parish, “Little Cathedral In The Bush”, which will be published in time for the OLHC centenary later this year. Fr Cassidy’s parents Joe and Molly Cassidy bought a farm at Neumgna, near Nanango, in 1941. He was the second of their 10 children and 11 months old at the time they bought the farm. He attended Meandu Creek School and helped his parents on the farm. South Burnett Online said Fr Cassidy remembered using “a wood stove for cooking and kerosene lamps for light”. “The cows were milked by hand,” he said. “In the early 1950s my father bought a kerosene engine to generate power stored in twelve-volt batteries. Gympie parishioners continued the celebrations the day after Fr Cassidy’s jubilee event in Nanango. Brisbane auxiliary Bishop Ken Howell, Fr Pat Dowd and Fr Barney Wilson joined Fr Cassidy, many members of his family – some from as far as Emerald – and St Patrick’s parishioners for Mass at Gympie and the morning tea and lunch that followed. Bernadette O’Neill, on behalf of the pastoral council and the parish, spoke of Fr Cassidy’s many attributes. Parishioner Narelle Gruar said Fr Cassidy “responded in his usual quiet way and gave thanks for his years of service to so many people along the journey”. “Fr Pat has been a wonderful gift to those on the receiving end of his humility, sound faith, believing in people for who they are, sharing good times and not so good times,” Mrs Gruar. Fr Cassidy was administrator of the Kingaroy and Nanango parishes, before transferring to Gympie where he is dean of the North Country Deanery. “This Bible verse epitomises the life of Fr Pat Cassidy as a servant of God: ‘For what we proclaim is not ourselves, but Jesus Christ as Lord, with ourselves as your servants for Jesus’ sake’ (Corinthians II:4-5),” Mrs Gruar said.